primarily known simply as Amma ["Mother"], is a Hindu spiritual leader and guru, who is revered as a saint by her followers. She is widely respected for her humanitarian activities. She has been described as "the hugging saint". 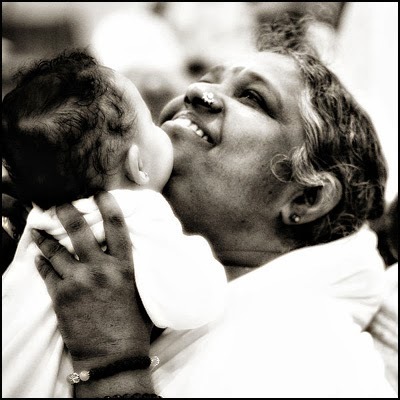 The world celebrates Mata Amritanandamayi's 60th birthday today, Sep 27, 2013. Mighty mountains break down with the passage of time to pebbles, gravels and sand grains. Has anybody any time observed sand grains, gravels and pebbles growing into mountains. Perhaps never. But it has happened in the case of Mata Amritanandamayi. Born in a poor environment and tortured by everybody, including parents and siblings, nobody could stop this lotus to bloom to unfold her beauty of mind and the fragrance of her heart. Affectionately called as the 'hugging mother', Mata Amritanandamayi has lighted up the fire of love, friendship, peace and kindness among millions across the world. She has conquered the world without any weapon. She has wiped tears of million eyes, spread the light of education by helping the poor children, given shelter to the homeless, specially to the 2004 Sumatra tsunami victims and provided work to countless poor women. An incarnation of love, she has stood tall over decades by humanitarian activities. Love is her religion and kindness is her morning prayer. Let us all come together to celebrate her birthday today. May she live long and pour on the mankind her love and blessings! !